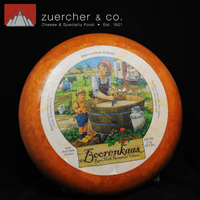 Boorenkaas 4 Year - Zuercher & Co. Unlike traditionally made cheeses, this unique farmstead cheese is handmade in small batches, using only pure unpasteurized milk. The family farms where this cheese is made are able to combine century-old traditions with handcrafted care. This combination guarantees a cheese with a stunning, complex flavor.